It is the shallow fashion of these times to dismiss the Tsarist regime as a purblind, corrupt, incompetent tyranny. But a survey of its thirty months' war with Germany and Austria should correct these loose impressions and expose the dominant facts. We may measure the Russian Empire by the battering it had endured, by the disasters it had survived, by the inexhaustible forces it had developed and by the recovery it had made. [Nicolas II] made many mistakes, what ruler has not? he was neither a great captain nor a great prince. He was only a true, simple man of average ability of merciful disposition, upheld in all his daily life by his faith in God. He is about to be struck down. A dark hand, gloved at first in folly now intervenes. Exit Tsar. Deliver him and all he loved to wounds and death. Belittle his efforts, asperse his conduct, insult his memory; but pause then to tell us who else was found capable. It his remarkable book, Nicholas and Anastasia, Robert K Massie brilliantly untangles the historical tragedy: "Why Lenin triumphed, why Nicholas failed, why Alexandra placed the fate of her son, her husband and his empire in the hands of a wandering holy man..." Such an amazing portrait of corruption, loyalty, suffering, self control and humility. 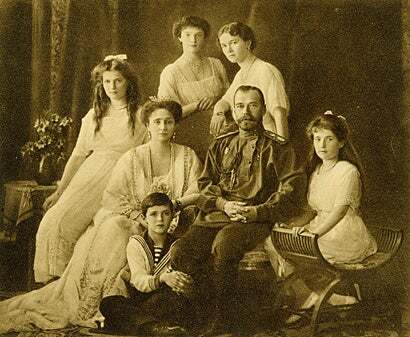 Thanks for sharing your love for the Romanov's...may their memory's be eternal! This book completely captivated me - have you read any of his others, Kelleylynn? No, I have not but would like to. Anyway, the link will show you the book that I love and kuddos to my hubby for purchasing it for a Valentine's gift...sometimes they do have some good ideas up their sleeves. Don't ask about the "one size fits all" sweater :( LOL! I saw the link - that book looks amazing! What a sweet Valentine's gift. Yes, sometimes they do get it right, don't they? My husband creates great playlists for me - today's version of the "mixed tape." It warms my heart every time. I'm reading "Grand Duchess Elizabeth" now - our parish saint - pretty amazing, as well. Yes! Read that too...have you read "Ella's story: The Duchess who Became a Saint" to your children? It's such a sweet book...that I love to read again and again. Our Hannah Elizabeth is named after her and she (St. Elizabeth) is one of the reasons why I am Orthodox -- after reading her story -- I had to be! Thank you for your condolences. Bobby and Molly's family is so very special.